Our hoophouse hydrant with drip irrigation supply equipment. The February Growing for Market issue is out, including my article on drip irrigation, which will help people new to drip get started. I was a reluctant adopter myself, maybe 10 years ago, and I’ve become a big convert. I explain the basics and include the options on tape width, wall thickness, emitter spacing and flow rate, to help everyone get the options that’s best for them. I have a worked example of the calculation and links to more information. I show how to figure how long to run the system for each week, and the pieces of equipment you’ll need. I talk about maintenance and repair too. 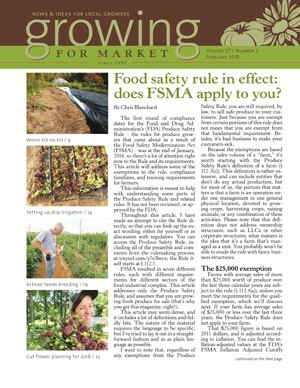 Other articles in this issue include Chris Blanchard on the Food Safety Modernization Act (pronounced Fizma). Of course none of us want to make anyone sick from eating crops we grow, but if you are a farm with average sales of more than $25,000 worth of produce a year , this new rule applies to you. All the details of exceptions and compliance are in the article. Sam Knapp writes from the Upper Peninsula of Michigan about tackling quackgrass (Elymus repens) without chemicals. We know this as couch grass, a cool weather wandering perennial with long sturdy white roots. It’s not the same as wiregrass, a bigger problem in the South. That’s Cynodon dactylon, also known as Bermuda grass and scutch grass. It’s a fine-leafed wandering perennial that dies back in the winter. If your problem grass is brown in winter, suspect wiregrass; if it’s green, suspect couch grass. Sam Knapp advises on how to deplete the rhizomes of couchgrass/quackgrass with repeated tillage going into the winter and mowing in summer. Ricky Baruc writes from Orange, Massachusetts, about mulching with cardboard (topped with hay or manure)and silage covers to control weeds and replace the need to till. The editor adds a note that some organic certifiers prohibit cardboard that has ink in colors other than black. 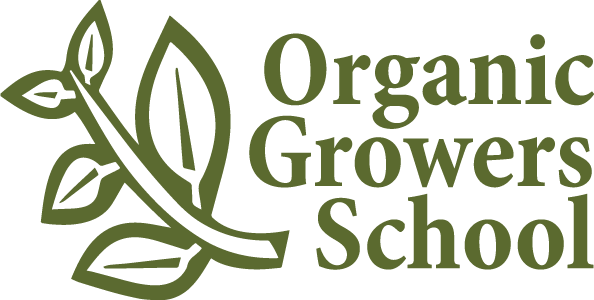 Check with your certifier if you are certified organic. Ricky Baruc also uses cover crops, which he crimps and plants into. He is able to manage several acres of intensively planted crops on his own. If you’ve ever coveted those Bumble Bee tomatoes in the Johnny’s catalog, you’ll enjoy the interview with Fred Hempel, their breeder. 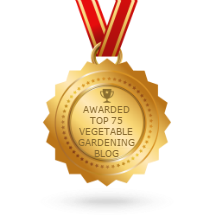 The last article is about winter cut flower planning, and is by Gretel Adams who regularly writes about cut flowers for GfM. February 23 is CSA Day. CSAs will be promoting their work and signing up new members. Data gathered by Small Farm Central showed that the most popular day for CSA signups was Fri Feb 28. And so CSA Day is celebrated on the last Friday of February to encourage more signups and to publicize the whole idea of community-supported agriculture. CSA is a way for farmers to sell directly their customers. In the original CSA model, people pay for a season’s worth of produce (a membership), at the beginning of the season. The members then receive a box of produce every week throughout the harvesting season. The members are supporting their farmer by paying up front, when the farmers most need the income to get ready for the growing season. Today there are variations on this theme, so look around and see what’s available near you. 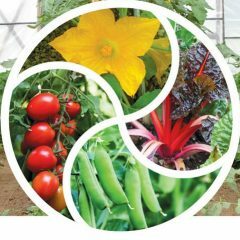 The Organic Farm School Spring Conference is Friday–Sunday, March 9–11, 2018, at UNC Asheville, NC. Click the link to read more and to get to registration. Pre-conference workshops are on Friday March 9, with the main conference 90-minute sessions on Saturday and Sunday. I’m offering two workshops on Saturday, which I’ll repeat on Sunday. This conference tends to offer workshops twice, so people who can only come on one day can choose which is best for them, and fewer people have to miss a topic they are interested in. 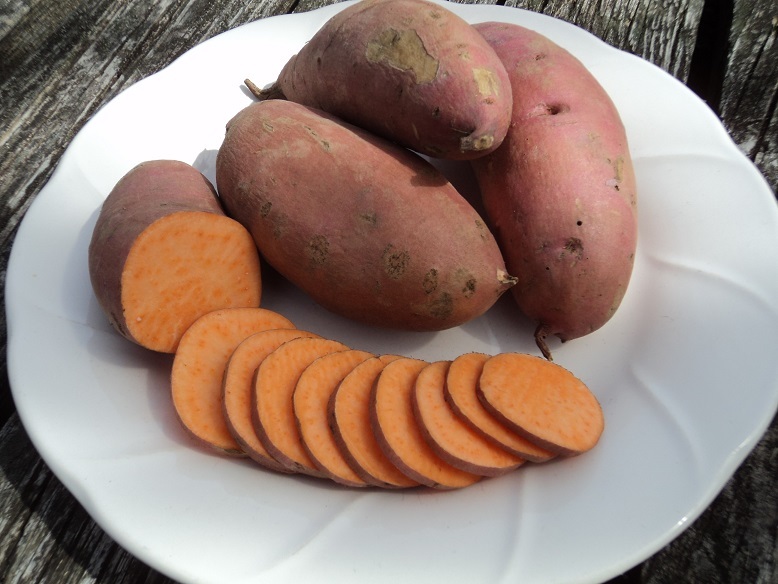 My workshops are Sustainable Farming Practices and Growing Sweet Potatoes from Start to Finish. Sweet potatoes on a plate. House Bill 825 (HB 825), introduced by Virginia House of Delegates Barry Knight (R-Virginia Beach), would require herd share dairies to register with the Virginia Department of Agriculture and Consumer Services, be open to premises and paperwork inspections, and adhere to stipulations put forward by VDACS. “While the sale of raw milk is illegal in Virginia, raw milk advocates have used the concept of herd sharing to obtain the revered, nutrient-dense food for decades. In a herd share agreement, consumers pay a farmer a fee for boarding their animal (or share of the animal), caring for the animal, and milking the animal. The herd share owners then collect the milk from their own animal. No sales occur, the animals are taken care of, and everyone gets to enjoy the magical elixir that is raw milk. Herd share agreements have been in use in Virginia since the mid-1970s” Christine Solem, Virginia Independent Consumers & Farmers Association (VICFA). On 2/5/18 The Subcommittee #1 recommended striking this bill from the docket. On 2/13/18 the House left this with the ANCR (Agriculture, Chesapeake and Natural Resources) Committee.